LSE’s Library sits on one of the most interesting sites on the campus, writes LSE Archivist Sue Donnelly. In the past it has been a graveyard, a workhouse and from 1839 to 1913 it was the site of King’s College Hospital. 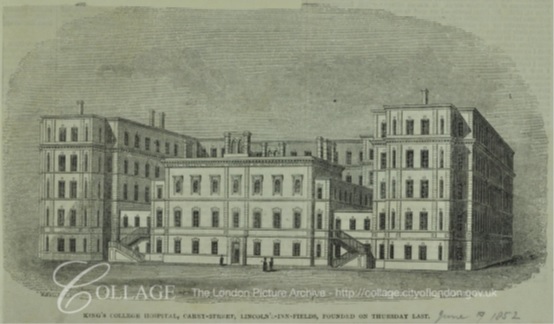 King’s College Hospital opened in a converted workhouse on Portugal Street in 1839. The workhouse was replaced by a new hospital building in 1861, close to Lincoln’s Inn Fields but also the overcrowded slums around Vere Street. Charles Booth’s Inquiry into Life and Labour in London (1886-1903) visited King’s College Hospital as part of its investigation into nursing and women’s employment. Initially the Inquiry sent the hospital a questionnaire asking for details of its size and staff. The hospital had 220 beds, 33 nursing staff and 27 domestic staff supported by 17 charwomen who were paid by the hour. Of the 33 nursing staff nine were sisters, 24 were ordinary staff and there were 40 probationers in training. 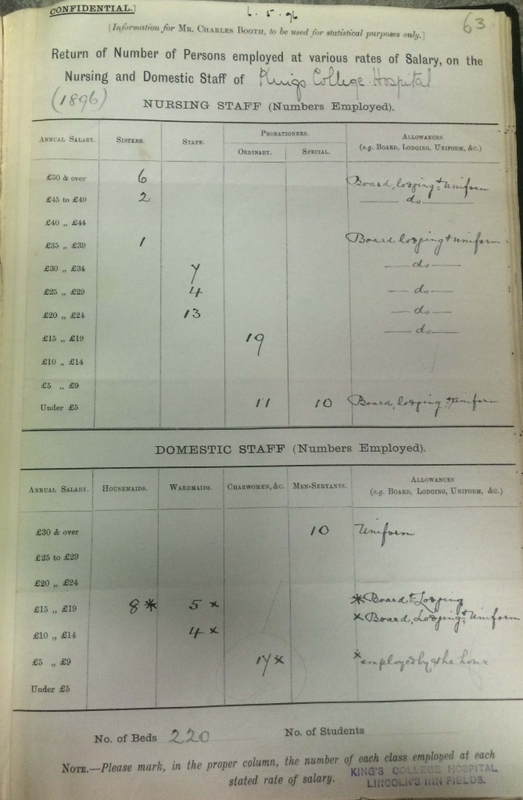 Six of the nursing staff earned over £50 per annum while most of the probationers were earning under £5 per annum. The nursing staff all received their uniforms, board and lodging. The 27 domestic staff included ten male servants (all earning over £30 per year), eight housemaids and nine ward maids and again most of the staff received a uniform, board and lodging. The housemaids and ward maids received between £10 and £19 per year. On 9 April George Duckworth, one of Charles Booth’s assistants, visited the hospital to interview the Sister Matron, Katherine Henrietta Monk (1855-1915). Katherine Monk was part of a generation seeking to modernise the nursing profession. She trained at Edinburgh Royal Infirmary and St Bartholomew’s Hospital London before working at St Bartholomew’s, King’s College Hospital and Charing Cross Hospital. In 1884 she was appointed as the first Sister Matron of King’s College Hospital. Katherine Monk reorganised the Nursing Department and founded the training school for nurses. She was also a founding member of the Committee of the Royal Pension Fund for Nurses, was one of two civil matrons appointed by Queen Alexandra’s Imperial Military Nursing Service Advisory Board and was also on the Council of the Red Cross Society. She left the hospital in 1906 after a severe illness and died in 1916. There is still a ward named in her honour in the current King’s College Hospital in Denmark Hill. In her interview Monk talked about the training of nurses and the routine of the hospital. Monk told Duckworth that the nurses were drawn from all classes of society but stresses that “no women can be a sister here who is not a gentlewoman born”. The training took six years – three years as a student nurse, two years as a probationer and one year as a staff nurse before becoming a certified nurse. After training the nurses had good prospects – some became sisters at King’s College Hospital or elsewhere while others became private nurses or undertook district work. Katherine Monk believed that the best nurses remained in hospital employment. Probationers received little pay beyond their board and lodging but by the sixth year of training they could be receiving £35 per year. Sisters were paid £35-£50 per year and had a bedroom and sitting room as well as indoor and outdoor uniforms. Hospital matrons would earn between £70 and £150 per year. Monk said that pay had risen in recent years and nurses benefited from a national pension fund. Nurses were entitled to time off and leave. Sisters and staff nurses were free at weekends Friday afternoon to Monday morning and probationers received one full day a week. 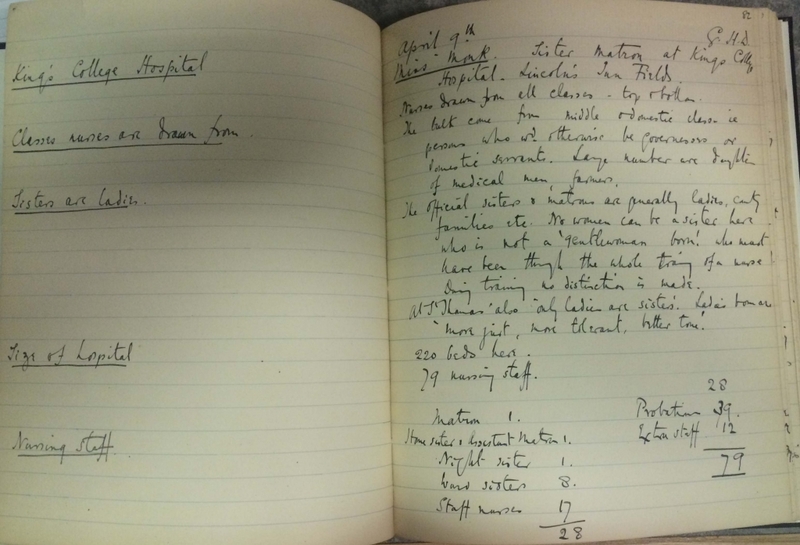 Sisters received six weeks holiday, staff nurses four weeks and probationers three weeks and there was a convalescent home for nurses who were taken ill. The hospital day began with breakfast at 6.30am and shifts were from 7am to 9pm with half hour breaks for lunch, dinner, tea and supper along with a further two hours of rest during the day. Each ward was covered by a sister, staff nurse and four probationers. At night there would be one staff nurse and one probationer. In 1913 King’s College Hospital moved to Denmark Hill, south London, on land donated by William Frederick Danvers Smith (later Lord Hambleden), a member of the WH Smith family. The site on Portugal Street was taken over by W H Smith for their new head office, Strand House. W H Smith left Portugal Street in the 1970s when LSE acquired the building. Renamed the Lionel Robbins Building it became the home of LSE’s Library in 1978.